Thumb screws and the iron maiden are no longer considered proper interview tools. Nasty traps are rarely set for candidates. The most common snare is a reasonable question or a pause that becomes the killing moment in an interview. We’ll talk about pauses another day. What do we have to pay you to get you to work here? Are you willing to do anything necessary to get the job done? When you get a dangerous question you should answer it accurately. That doesn’t mean you need to go into a lot of detail. Over the next few day we’ll touch on each one of these questions. For now, remember to be brief. Any one of these questions can bring out old job wounds. Job wounds are things that happened at a previous job that you are afraid will happen again. Get over them. This is a new company. Don’t yell, whine or complain about the past. If you have to mention something that is ugly, state the fact in one short sentence and stop. Don’t explain. Don’t fill in the details. Let your interviewer assume what he wants. You will find that their imagination is often more generous to you if you are extremely brief and only mention facts. 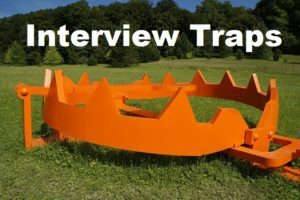 The secret to avoiding interview traps is to prepare an answer in advance. Use that answer and avoid going into areas that are painful for you. Brevity is a key. Write down a one sentence answer to each of the questions above. Next week compare those answers to the guidelines for each question. Later: What are your weaknesses? What do we have to pay you? Will you do anything we ask?